While the Empire ostensibly rules the galaxy, there are shadowy corners where other sinister powers hold sway. 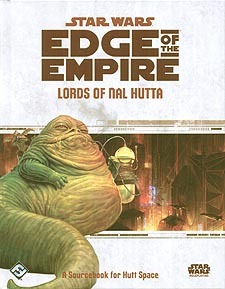 Hutt Space is one such place, where avarice reigns supreme - and none can match the endless appetite for power of the Hutts. To enter their domain is to gamble everything for a chance at enormous rewards. Delve into the seediest realms of the galactic underworld in Lords of Nal Hutta. Explore the swamps of the Hutt homeworld and the neon spires of Nar Shaddaa, and range across the deadly wilds of Kintan, Sriluur, and Toydaria. This book contains everything that daring fringers and fugitives need to seek their fortunes on the world of the galaxy's most notorious gangsters. Detailed profiles for the major worlds of Hutt Space. Four new species options, including the mighty Hutts themselves. New weapons, equipment, contraband, and vehicles used and sold by the Hutt kajidics and their minions. Five modular encounters that GMs can use to weave this deadly region into an existing narrative or craft an ongoing adventure within Hutt Space.